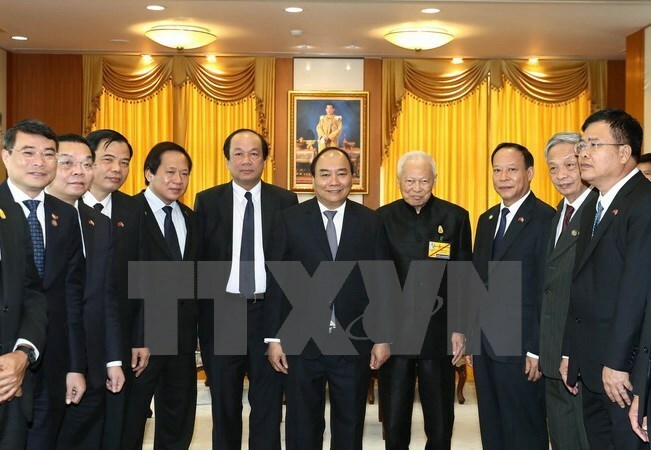 Bangkok (VNA) – Prime Minister Nguyen Xuan Phuc on August 18 had meetings with President of Thailand’s Privy Council Prem Tinsulanonda and President of Thailand’s National Legislative Assembly Pornpetch Wichitcholchai as part of his ongoing visit to Thailand. At the meeting with President of Thailand’s Privy Council Prem Tinsulanonda, PM Phuc hailed the attention of the Thai Royal Family to the development of friendship and all-round cooperation with Vietnam over the past years, and thanked the Royal Family in supporting the Vietnamese community in the country. Prem Tinsulanonda said that the Thai Royal Family and Government always treasure and prioritise ties with Vietnam, considering Vietnam as an important partner in the region, noting that Vietnam is the only strategic partner of Thailand in ASEAN. He expressed delight at the signing of many important cooperation agreements on the occasion of PM Phuc’s visit, saying he believes the visit will help further deepen the strategic partnership between the two countries. He also noted that the Vietnamese community has made positive contributions to the development of Thailand as well as the growth of partnership between the two countries. At the meeting with President of the Thai National Legislative Assembly Pornpetch Wichitcholchai, PM Phuc congratulated Thailand on the new Constitution, adding that he believes Thailand will successfully organise the upcoming election. He suggested that legislative bodies of both sides maintain the exchange of delegations to increase information sharing and mutual understanding, while coordinating closely in building the ASEAN Community through different channels, including the ASEAN Inter-Parliamentary Assembly. The PM also proposed that the Thai side open its door wider for Vietnamese goods and encourage Thai investors to invest more in Vietnam. For his part, Pornpetch Wichitcholchai held that the Vietnamese Government leader’s visit will create new momentum for the development of the strategic partnership between the two countries, especially in economy, trade and investment.